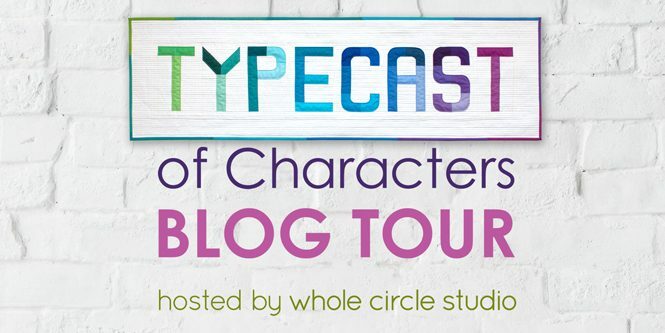 Welcome to my stop on the By Hand blog hop. By Hand was designed by my friend, Amy Friend for Contempo, a division of Benartex. When Amy asked me if I would make something with her new collection, I immediately knew I wanted to make a Patchwork Petals quilt. The organic nature of the shapes and irregularity of the prints pair perfectly with the petal shapes of my pattern. Plus, I love rainbow colors and her collection features pink, mango, golden yellow, grass green, teal and plum. 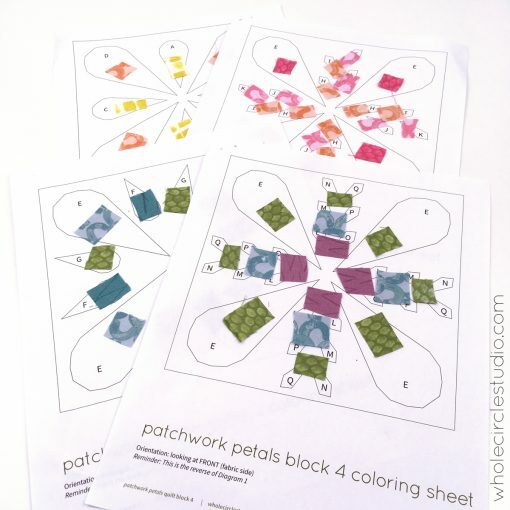 First step: print out the Patchwork Petals Coloring Sheets (included with the pattern!) and play with color and placement! These coloring sheets are so helpful for keeping organized while piecing. For the background, I used Color Weave White by Contempo Studio. It’s a great blender with a slight texture to it. 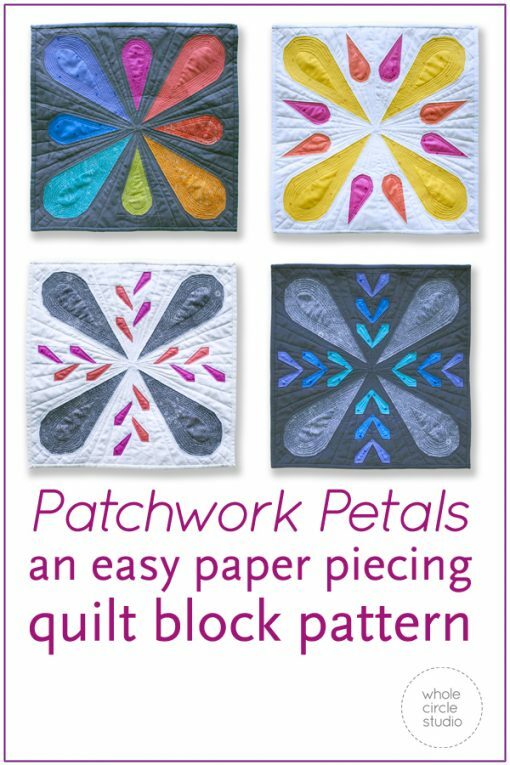 Patchwork Petals is a confident beginner/intermediate foundation paper piecing pattern. I felt it was fitting to use this technique while making something with Amy’s fabric since she is a fellow pattern designer who loves paper piecing too! Now I need to decide how I want to quilt this Patchwork Petals sample! Want to learn about the inspiration for the design of Patchwork Petals? Want to make your own Patchwork Petals? Be sure to follow along with the blog hop to be inspired by other By Hand projects! 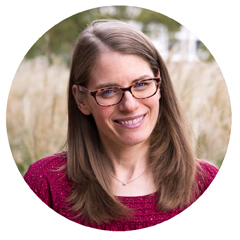 … and now, for the GIVEAWAY! Enter for your chance to win a fabric bundle of By Hand (sponsored by and shipped directly by Benartex). Because of shipping logistics, only residents of the US are eligible to win. 2. In your comment, answer: What would you make with a By Hand fabric bundle? One lucky winner for each prize will be selected by True Random Number Generator. GIVEAWAY CLOSED. Congratulations to the winner: Nancy S. Thank you to all who left a comment! Beautiful use of the fabric in the Petals pattern! I would use the fabric in a quilt of some sort, but not sure of which pattern I’d use. 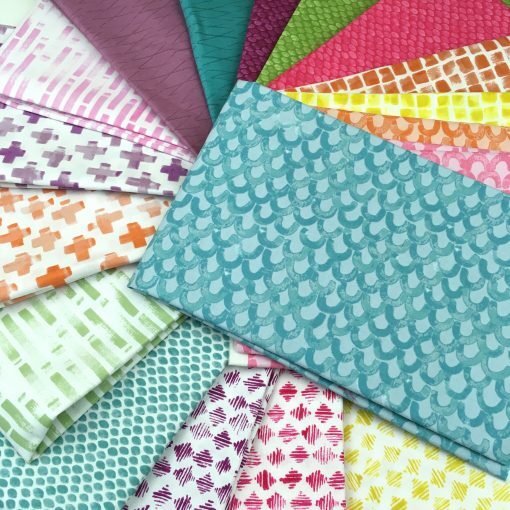 I LOVE Amy’s new fabric collection! I would make myself a quilt ! no gifting here! I think these patterns would make an amazing Cathedral Window Quilt! Sheri, what a great tribute to the Paper Piecing queen. Amy got me started with her Fat Quarter Gang Pillow 5 yrs -ish ago. By Hand is simple, dreamy and I would want it in my bedroom. So a bedrunner is in order with that bundle. Thank you! Love this modern, clean fabric line. I would make a simple baby quilt to show off the fabric. I love you quilt! It’s so amazing! I probably would make something with flying geese…I’m a bit obsessed with them lately! So pretty-I would make the pattern shown or the dragonfly pattern I purchased when you presented at our quilt guild. Very pretty quilt! I like how each section is a little different. I would make a baby quilt. I am new to paper piecing and quilting in general – so right now my projects tend to be pillows so I don’t feel overwhelmed! But my best friend has a baby on the way, I’ve been thinking that a baby quilt should be my next project. These bright colors would be perfect! 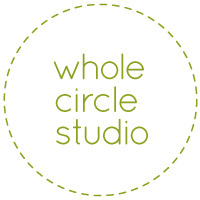 I have several patterns by Whole Circle Studio – I think I would use for those – the dragonfly would be perfect for sure! This is gorgeous. Seeing as I bought the petals pattern this spring, I’d make this very quilt if I were lucky enough to win the vibrant fabric bundle. i think a large size flying geese that lets the fabrics really show would be perfect for these fabrics. I love the colors and style of this fabric line. I am not sure exactly what I’d make yet, but I am thinking pillow covers maybe. That can really change up a room’s looks. I would like to make a subtle “rainbow” quilt with the gorgeous bundle! That Petal Quilt is very unique. I would like to try making it if I should win the giveaway. The colors are amazing! A very beautiful Quilt! Thank You! I would make a baby quilt with this fabric because it is neutral enough for either a boy or girl. I would make a quilt using Anita’s Arrowhead pattern. It’s my new favorite. Beautiful quilt and beautiful fabrics. Thank you for the chance. I would make a sampler quilt. Love the fabric. I would make a new quilt for one of my granddaughters. She is 13 and has outgrown the Cinderella story book quilt that I made for her when she was much younger. Hmmm, I wonder how this fabric would work with your Sew Speedy pattern? I’d like to try that. That’s a wonderful quilt block and I wouldn’t have thought it to be paper pieces. I’d love to make a mini pineapple quilt with these great prints and colors. I have baby Quilts in my future, so this is a perfect fit. Love your Quilt!! Love petals…& would love to make your pattern (with more blocks..) or a Cathedral Windows quilt! 🙂 Thank you for chance to win your give-a-way! Loooove this Collection! I would like to make a lap quilt with it, maybe I would have it done in time for spring. Really love your design! I think I’d love to make some runners for gifts! Your petals quilt is so pretty – not a paper piecing girl, myself. I would love to make a quilt for my beautiful granddaughter. She loves a rainbow of color. That’s a really hard question. I love so many of the colors in the group, and i use them in almost all my quilts….I would probably work them into my next big scrap quilt project. Thanks for the giveaway. I LOVE the Patchwork Petals quilt. I want to make it with the fabric I will win! I see cloth napkins in my future. Several of these patterns would complement tablecloths I have. I love the colors of By Hand – so bright and fresh! They are definitely made for a pick-me-up lap quilt. Thanks for the giveaway. I would love to make some fresh placemats for my kitchen with this beautiful fabric line! I would make a beautiful baby quilt! I would make a quilt with these beautiful fabrics….. they are do yummy!!!! I hope to make a couch quilt. Of course I have to buy a couch and win the fabrics but dreams do come true right?! Thanks for the chance to win and your quilt is beautiful!!! Beautiful! And I would make a quilt! I would make a Drunkard’s Path. It has been on my To Do list and these fabrics would be perfect. I love the look of your quilt, very pretty. I would make with a quilt for my daughter-in-law with the By Hand fabric bundle. She loves the colors and fabric so much! I would make placemats with matching napkins. Any leftover fabric would be used for hot pads and potholders. I love paper piecing! This is a beautiful pattern! I would make a quilt of course! I have a few friends who are pregnant so baby quilts are needed! I would make a modern pieced quilt that would show off the lovely fabrics. Very cute quilt. I would make a baby quilt with that fabric. Wonderful colors. I think I would make a lap quilt with a By Hand fabric bundle. I really like your pattern petals. I would like to do more paper piecing and will be giving it a try if I do win. A throw quilt would be beautiful in these fabrics! I would make a throw size quilt, possibly with stars. I love the colors. Dare is say that I make a quilt for myself. Your Picnic Petals pattern would look great using these fabrics. Would love to win the bundle and make it. Very Pretty quilt. What I would make: I think the fabric is well suited for a quilted kitchen/breakfast area set – potholders, apron, table topper, placemats, etc. You made a lovely quilt in the beautiful fabric. I would definitely make a quilt…such beautiful colors to showcase! I am designing a mini quilt for each month. I think the mini quilt for May will have various flowers on it. These fabrics would be perfect to make my mini quilt for May with. Beautiful quilt! I would love to make a quilt for my mother in law! I love that pattern in that fabric collection – a good fit. I’d probably use that fabric for a quilt for my middle son’s assistant teacher. He’ll be headed to kindergarten next year, so I want to thank her and the head teacher for everything they’ve done to help him learn and grow. One of our nieces just left for college. I think she would love a quilt for her dorm room made with this fresh and lovely fabric. I love the beautiful colorways in this BY Hand collection. I would make pillows to go in my new “she cave”! Love your petals quilt. I would make a hunters star quilt. Thanks! 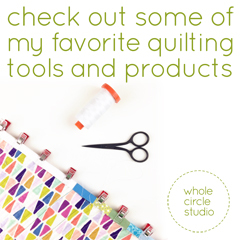 This is a great fabric line and your quilt shows it off so well! I’d probably make a baby or throw size. I love the colors and might have to keep this one for myself. Would like to make a rainbow quilt. The colors in By Hand fabric line would be perfect. My daughter is hitting the big 3-0 next April and needs a quilt worthy of a milestone birthday! I think a “Mod” rainbow quilt would be awesome! Beautiful quilt! I would make a quilt for my granddaughter with these prints. Hi this is Elizabeth Johnson comlisajohnson @gmail.com I love Amy’s new fabric it looks great for doing foundation paper Piecing! I would make a Woppet Bucket by @cleverpoppet on IG! Makes a great basket or a cute purse! Thank you for the chance! 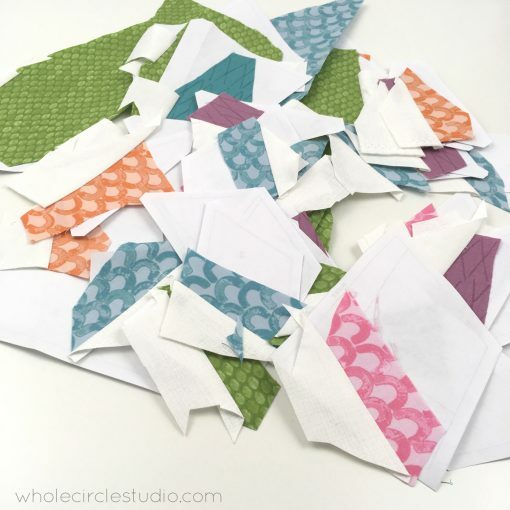 I love Amy’s new fabric line and I also love paper piecing. I’d like to recreate the quilt I designed for this past 2018 Charity Challenge and use prints in place of the solids. I think these fabrics would make a great baby quilt. I would use this beautiful fabric to make a modern plus sign quilt. I would make the Patchwork Petals. I purchased the pattern and haven’t started on it so winning this would be great! Having been on “team duvet” until this past year, I would make myself a summer quilt. The colours are so fresh and cheery. I would love to design my own quilt using the beautiful fabrics and EQ8. Such gorgeous colors. Would love to win and use them. Beautiful fabric line! I would use it for one of the curved piecing patterns from Sew Kind of Wonderful. Thanks for the opportunity! I would like to try your petal pattern it makes me happy to look at it.. These colors are So Cheerful! They make me smile 🙂 I’d make a lap quilt for someone that needs some extra smiles in their day. Your quilt is lovely! I think I would make a trip around the world with this bundle if I were to win it! 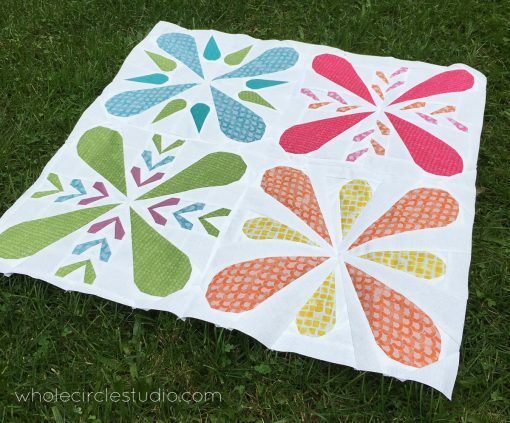 Love your original Petal quilt & the fabric is luscious and would make a wow quilt. Your paper piecing pattern is lovely with a nice curve illusion. What would I make with the bundle? Something simple – may be interlocking stars or pinwheels – to let the bright fabric take center stage. I love the colors in the fabric bundle. Would look great in a baby quilt or tote bag. I would make a Patch Works quilt. I have been meaning to try paper piecing so having this fabric would be a perfect start. Thanks!! I would make a pretty crib quilt with these bright fabrics. I love the rainbow of colors! I would make a tote bag or baby quilt. Beautiful line! Seems everybody is having babies these days so I would make a baby quilt. Sooo pretty!!! I would make myself a lap quilt to keep at work they keep our conference room so cold having a small pretty quilt to lay over my legs would be wonderful. Thank you for the generous giveaway. Lovely fabrics! I would probably use some in a couple of pillows for gifts. This might be a great pattern to try as well. I would make a throw… unsure of the pattern now!!! Thank you!! I love your petal quilt-that is what I would like to make! I would make a spring time throw quilt! Love this fabric line. Your petal quilt is really cute. Thanks for sharing. I would use these fabrics in a quilt, but not sure of the pattern. I love the soft colors and different prints. I think it would be perfect for a baby quilt. The petal quilt is gorgeous. I love this fabric collection! The colors remind me of rainbow sherbet so I think I’d make a spring table runner or a baby quilt. Your petal pattern is beautiful! I would add it to my soon to be started EEP quilt. Just the colors I love. Your quilt is beautiful! I also would make a flower themed lap quilt with this beautiful fabric! Thanks for your inspiring post. 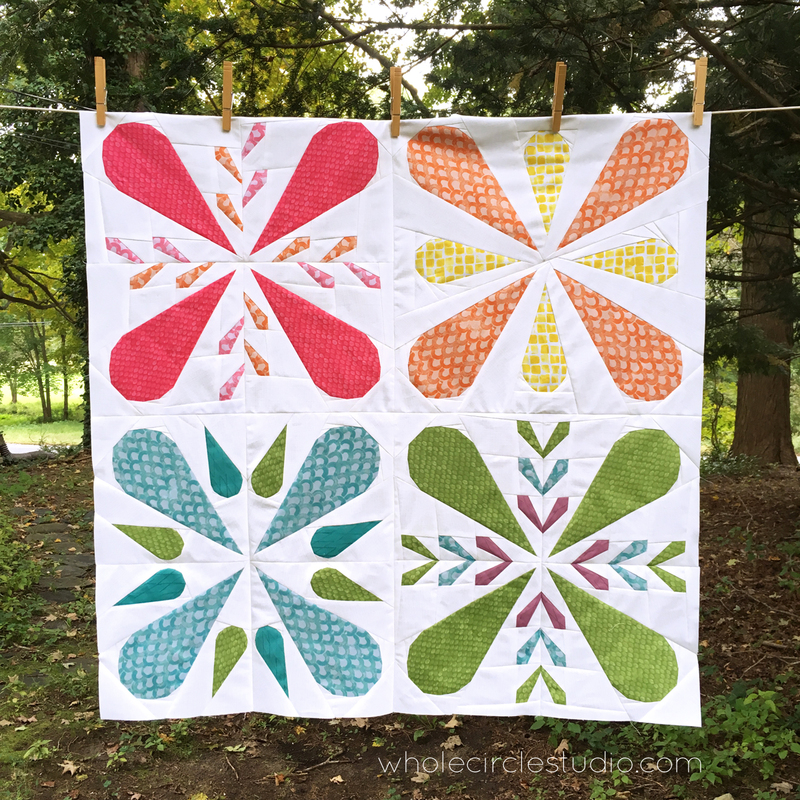 I have loved Patchwork Petals since you did it with Mister Domestic! 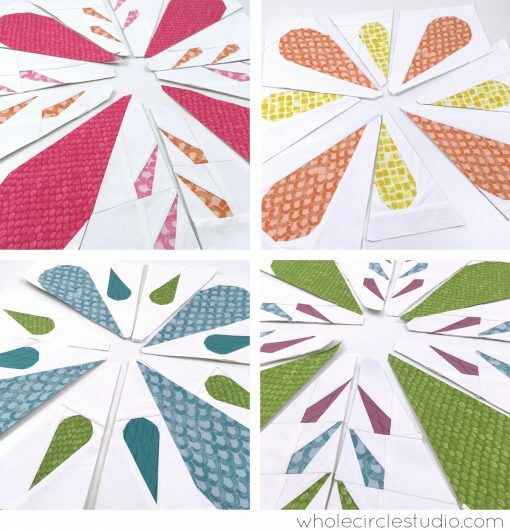 I can’t decide tho, I like both petals patterns, could be Picnic Petals too….hmmmm… Your friend’s line is perfect for either, quite pretty, I’ll post & tag what I make! I love these colors! I’d use the bundle in EPP–what great combinations I could come up with! Thanks for the opportunity. Very pretty fabric. I would make a quilt with it, as I love the colors!